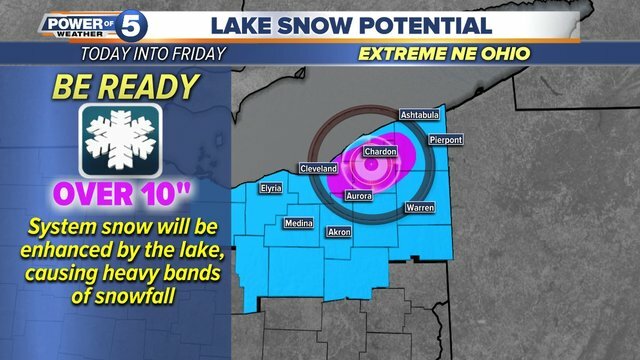 Mother Nature is bringing another round of heavy snow that will last into Friday morning. A Winter Weather Advisory went into effect at 3 p.m. Thursday and will go until Friday morning for counties in the snowbelt. A Winter Storm Warning was issued for portions of the Primary Snowbelt with 5-10" of snow expected. Some isolated areas may approach a foot of snow. The incoming storm is separate from the nor'easter storm that is pummeling states along the East Coast, but the two are working together to create widespread snowfall in Northeast Ohio. Power of 5 Weather is tracking lake-enhanced snow that started Thursday afternoon and will continue with momentum into Friday morning. The wind increase, with wind speeds that reached 25 miles per hour, caused some visibility issues during Thursday's evening commute with snow blowing around while the majority of people were on the road. Snow is expected to cause a messy morning commute on Friday. If you live in the snowbelt, chances are you will see a good amount of snowfall through Friday morning. 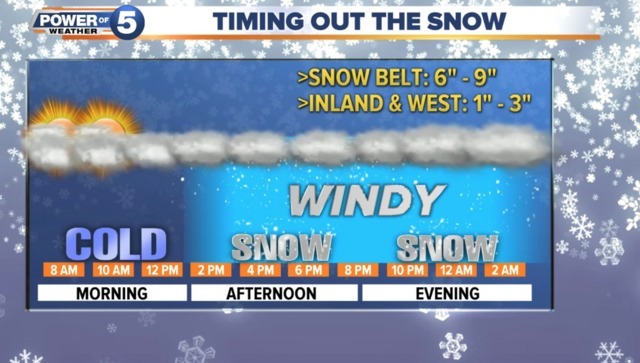 For those who live in Elyria, Akron and some parts of Cleveland, snowfall is expected to reach somewhere between 1-2 inches. 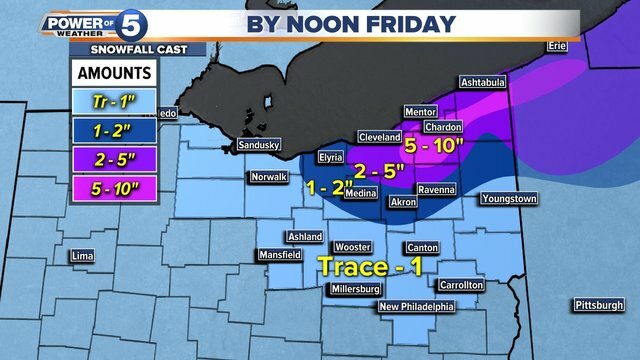 Greater Cleveland as a whole could have between 2-5 inches of snowfall. RELATED: Have a snow day? Find the most updated list of school closings here . RELATED: Stay up to date with severe weather alerts here . Move closer east towards the state line, and snowfall amounts could reach up to 10 inches. 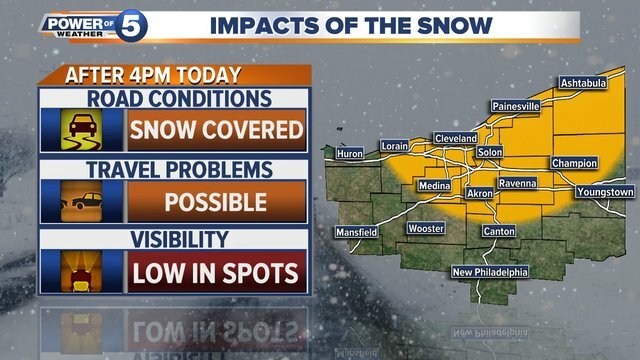 While residents further east in Ashtabula and Geauga Counties are used to heavy snowfall, road conditions and visibility should be taken into consideration.